The internees were particularly incensed by Date’s decision to put them to work. They were soon engaged in snow-clearing, housekeeping, and renovation work, all of which Date had determined to be fatigue work without pay. In addition to being exploitative then, the work was back-breaking and often in direct contravention to the rules set for prisoners of war by the Hague Convention of 1907. When internees refused to work Date simply doubled down, punishing their contrariness with the elimination of monthly gratuities, abated rations, and sometimes even solitary confinement. The internees responded by organizing and going on strike. They informed the administration that they would only go back to work when their former privileges were reinstated. At first the strike was strong, but enthusiasm waned when Date refused to issue any rations to the camp. After two days the whole affair had been quelled and the iron rule of the Commandant was firmly established. A cold cheerlessness settled over the Fort and remained until February when persistent rumours reached the internees that they would soon be transferred to the Kapuskasing internment camp. The most popular explanation was that the storage of cordite and other combustibles in the Fort had simply become too dangerous. Others claimed that tensions with local authorities had hastened the move. 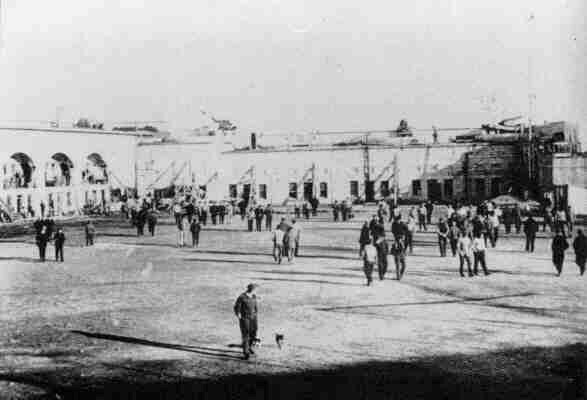 Privately, however, the camp’s administration had grown deeply concerned about the existing condition amongst the internees. They reported that the majority had grown insolent, angry, and restless in the aftermath of Date’s crackdown. Gainful employment, it was reasoned, was desperately needed for mind and body. Kapuskasing was just the place to send the idle internees. Under the auspices of the Canadian government’s colonization efforts in northern Ontario, railways and roads needed to be built, newly-discovered deposits of silver had to be mined, and the agricultural possibilities of the Clay Belt were waiting to be discovered. At least initially there was a belief amongst the internees that they would receive five dollars a day for their labour, a falsehood that the local authorities were only too happy to maintain. In reality, this work was performed for approximately twenty cents an hour, from which all food, clothing, and canteen supplies were deducted. Unsurprisingly, when the internees were eventually freed from the camps, the majority left with virtually nothing. 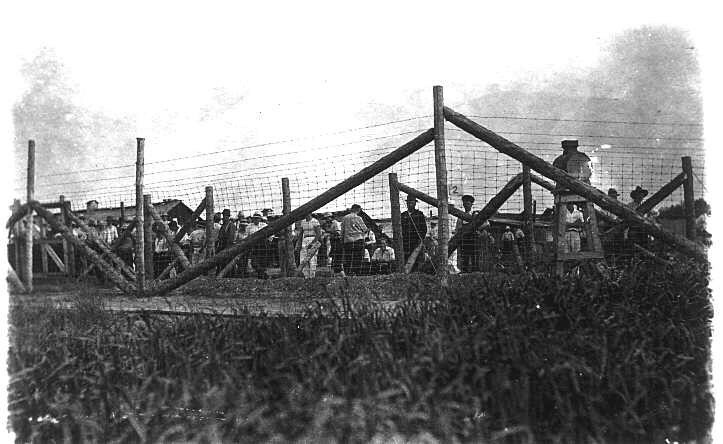 The prisoners of Kapuskasing were mostly so-called second-class internees, many of Ukrainian origin, who were interned for their Austro-Hungarian citizenship. They too had a long history of resistance to the forced labour regime of the camp, engaging in both passive resistance and forceful strikes at every turn. In the case of the Ukrainians, organizers for the Ukrainian Social Democratic Party (USDP), themselves interned for labour agitation, were especially active. By situating their incarceration within its economic and geopolitical context – coalescing the class and ethnic interests of the internees – USDP organizers were tremendously successful in helping shape and entrench a consciousness in the camp. By the time the Fort Henry internees arrived, few of the original inhabitants of Kapuskasing remained. The majority had recently been paroled to work in the aforementioned fields of railway construction, mining, and agriculture. They left the camp by the force of a bayonet, loath to continue their exploitation willingly. Many of the employment contracts assumed by the internees extended well beyond the conclusion of the war. 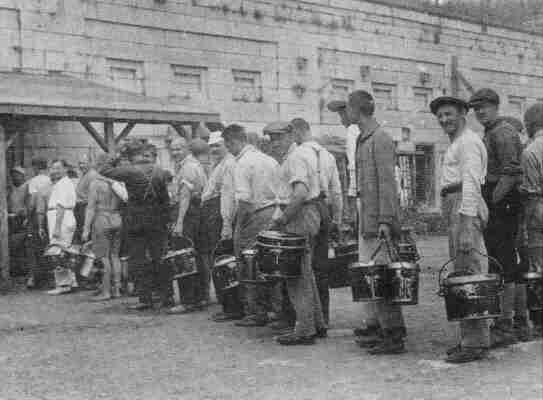 For example, internees released into the custody of the Dominion Steel and Coal Corporation (DOSCO) were held against their will well into 1920. While some remained on with DOSCO, they were blacklisted and terminated after organizing a union and going on strike in 1923. 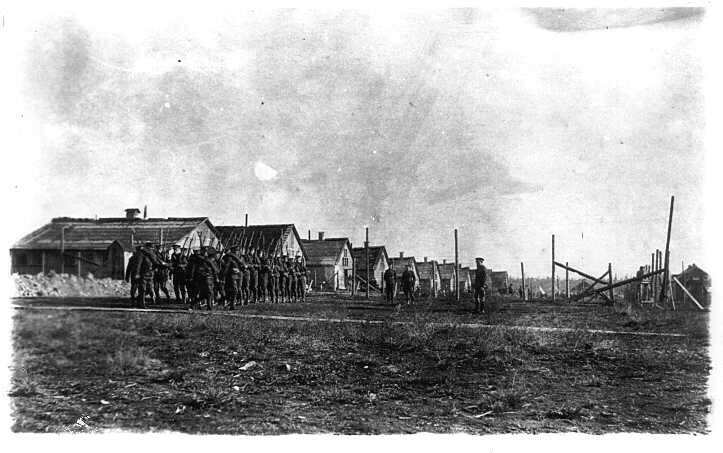 The migrated Fort Henry internees continued their resistance in Kapuskasing. Not yet released in 1919 due to administrative delay, they were soon joined by some two hundred “alien” agitators who had participated in the Winnipeg General Strike. The comingling of the Fort Henry internees with the “alien” radicals had an undoubtable effect on the former group. Spartacism, it seemed, had become their new favourite theme. When they were repatriated they did not bid their captors farewell, instead declaring that they would see them again soon to spread the revolution in Canada. Despite the clear prominence of themes such as ethnic radicalism, colonialism, and capitalism, the history of internment is rarely situated within these contexts. Nor is the link between internment, labour, and incarceration frequently made or explored. In part, this is an outcome of a still-embryonic historiography that has not yet had the benefit of serious interrogation or continual rethinking. At the same time, however, it is the result of limited interaction with others who explore these themes in their work. With this in mind, several colleagues and I have decided to organize a workshop on the theme of labour and the carceral state in Canada. It will be held on 14 – 15 March 2020 at Brock University. Our hope is to bring together scholars, activists, educators, artists, community members, and others – who might otherwise remain separated because of disciplinary boundaries, occupations, the stigma of the criminalized, legal barriers, and/or accessibility to academia – to discuss the contemporary and historical intersection of labour and incarceration in Canada. We are currently seeking workshop participants, and the deadline for proposals is 1 April 2019. While issues of carcerality in the United States are increasingly subject to critical examination, this has been less true in Canada, despite the existence of a wide range of issues, both similar and dissimilar to those of Canada’s southern neighbour. The Canadian carceral state is not limited to its police lockups, provincial and territorial jails, and federal prisons. Canada has a long history of state-enforced confinement in the forms of work and internment camps, reserve systems, migrant work programs, mental health institutions, and more. These institutions were – and in many cases continue to be – deeply intertwined with issues of work and labour. While important scholarly work is being done on incarceration in Canada, these efforts are often segregated in different academic disciplines within the humanities and social sciences. As such, this workshop provides an opportunity for scholars of work, labour, and incarceration to engage in direct dialogue across disciplinary boundaries. Kassandra Luciuk is a PhD Candidate in the Department of History at the University of Toronto. She is currently working with Nicole Burton of Ad Astra Comix on a graphic novel about the Kapuskasing internment camp.